> Tractor t-16, t-25f, t-25>Airborne transmission of the front axle and others. Front axle provides support front frame part, and provides together trapezoid turning steering direction wheels. 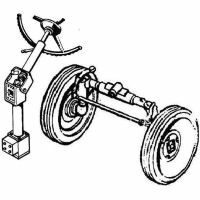 With articulation of the front axle including the axle and the frame, there is swing balancing device according to the perpendicular vertical plane of the axis of the chassis, giving the possibility of adapting the front wheels to the uneven ground regardless of the position of the rear unit of the wheels. The balancing device consists of the balancer and two are in it enclosures knuckles. On the surface of the rocker has a mark for jacking. swing axis mounted in the bracket hole and wedge preclude radial and axial displacement. Bushings swing axis disposed within the front frame bar. The rocker front axle tube from both sides are inserted housings knuckle. front wheel hub rotates on axis 2 tapered roller bearings fixed castellated nut. Front Axle T-25 includes transverse balancer knuckle with the axes of hubs of the front wheels , arms and thrusts of steering trapezoid. poluramy forward arm axis is also the axis of oscillation of the bridge. Due to the swivel axle with front wheels adapts to ground contours and does not depend on the position of the core unit and the rear wheels. Fixing the position of cams produced by means of pins in the opening cams and beams. In each fist has 4 holes to regulate the track of the front wheels. The protruding inclined part is pressed into the steering knuckle of the sleeve with the rotating shaft therein. Steering T-16 hydrostatic, there is no mechanical connection between the steering wheel and the control wheel axle. Hydraulic RU includes a gear pump, metering pump, double acting hydraulic cylinder, tank and oil lines. The drive mechanism transmits the rotation of the steering wheel on a shaft of the metering pump. Oil is pumped NS supplied to the metering pump, which the steering wheel rotation in either of the parties takes a certain amount of oil in the rod and rodless cavity HZ. Shifting, GC rod pivot arm acts on the wheel direction. When the metering pump is switched off diesel or completely off the clutch shifts to manual mode, under which the force on the steering wheel and the number of its revolutions rise, but we should remember that it is only used for short journeys.